Modern themes and features are all part of the latest trends in architecture and interior designs of today. Many clients believe that they need to have a modern house design to complement with their trendy lifestyle and work. 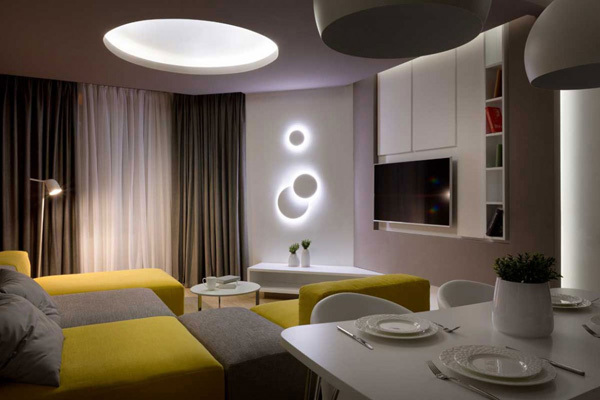 Today, we will see the efforts of the designer in making the client’s apartment look so trendy and futuristic, too. 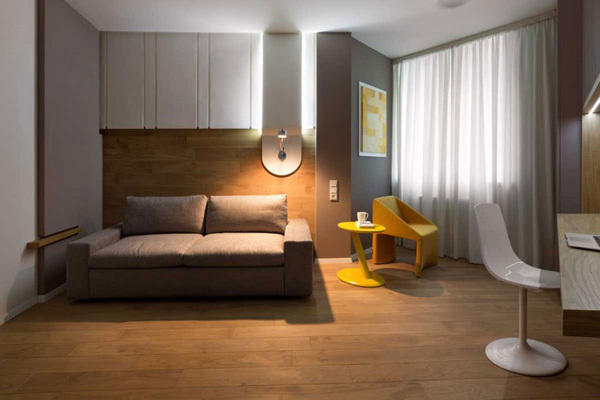 This apartment is named as the Moon Box. 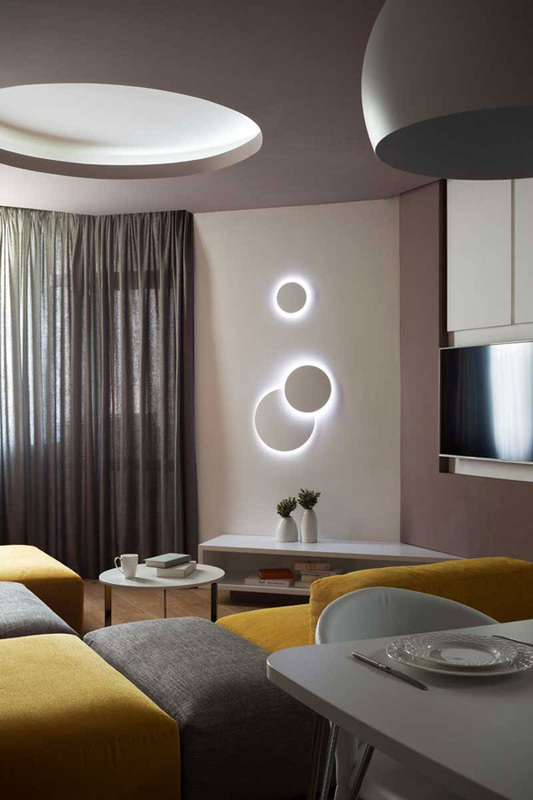 Moon Box is specifically located in Kiev, Ukraine and this apartment actually utilized the soft color palette that improves the interior’s appearance. 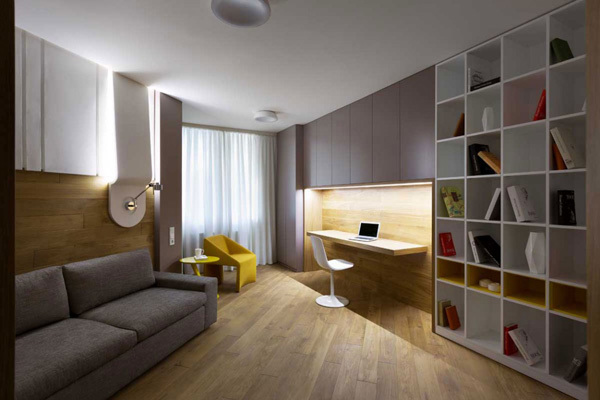 What is special in this house is that this project may certainly take the apartment away from the simple and natural surroundings. The designer created an artistic aura and set a mood that will allow the client to feel the superb modern and enchanting experience. 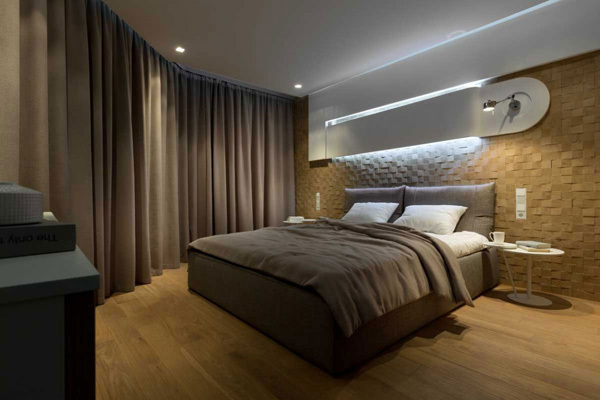 Scroll down the page and enjoy the amazing design of this apartment through the images below. 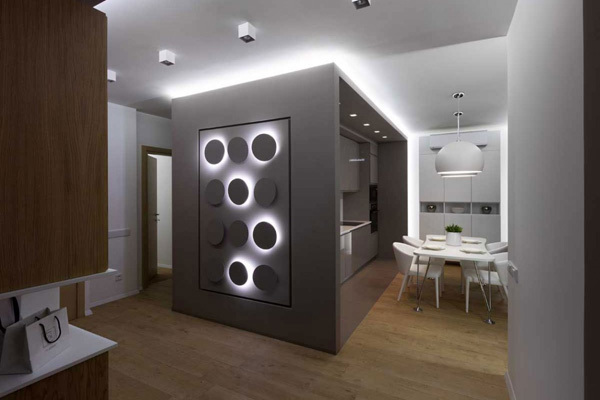 The lighting system utilized in the interior also highlighted its modern concept and style. 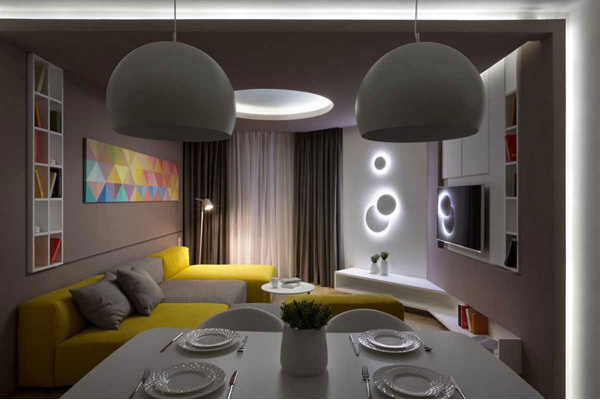 Yellow and grey palette is the best combination in showing the sun and the sand elements in the house. See how the volumes of this grey box seen inside the interior seem like a domino. Look at the curves of these chairs that simple complements with the round lamps hanged above this dining space. Comfortable seats stand out in this classy study room. The designer utilized the rounds and circles that emphasize the shape of the moon. 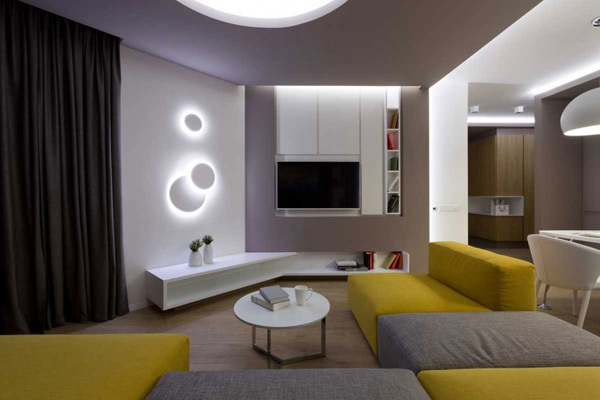 See the rough texture of the sofa which jives with the smooth and flawless texture of the walls and lamps here. 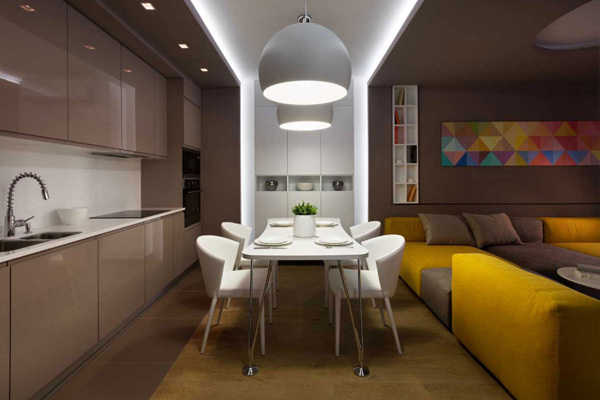 A kitchen, dining and living space in one to allow the designer maximize the functions of each space in this apartment. 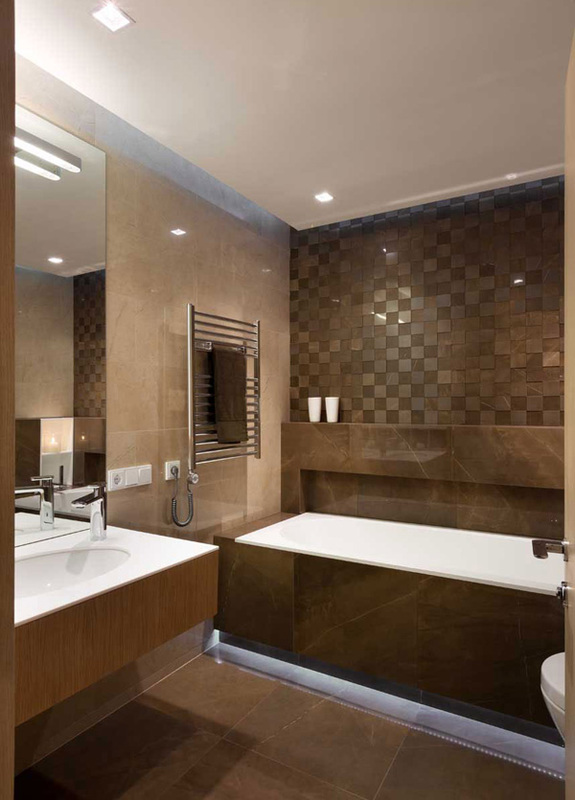 Light brown and white themed bathroom uncover the elegance and comfortable features on it. See how the designer place a simple yet functional box type built in cabinets here that serves an essential part of the house. Wooden and natural pattern seen from the floor and study table speaks of sophistication and charm. 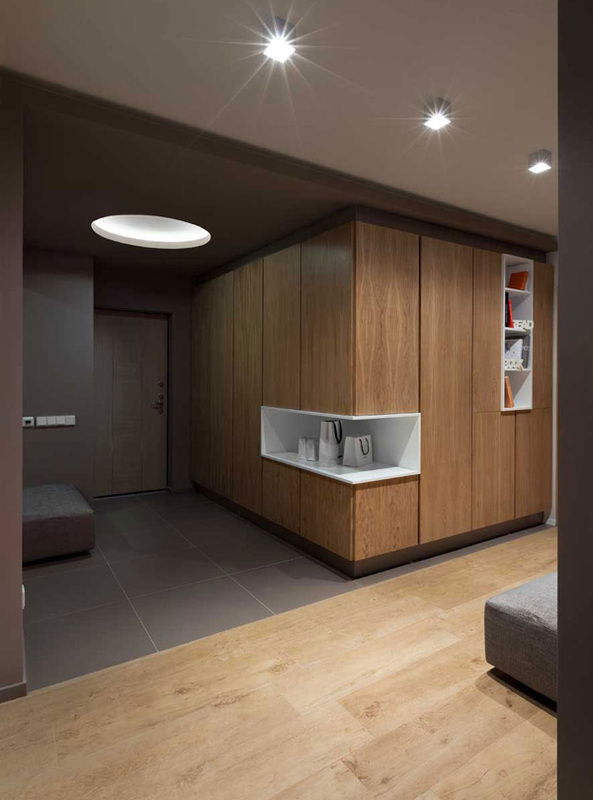 We can see how the designer creatively and artistically placed the stuff in this built in cabinet. 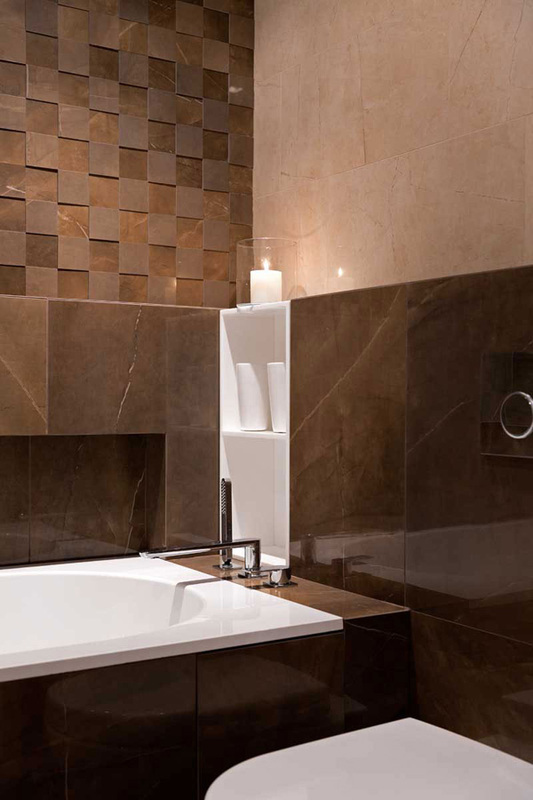 Even in the bathroom, the designer secures a clean and flawless space in this bathroom. 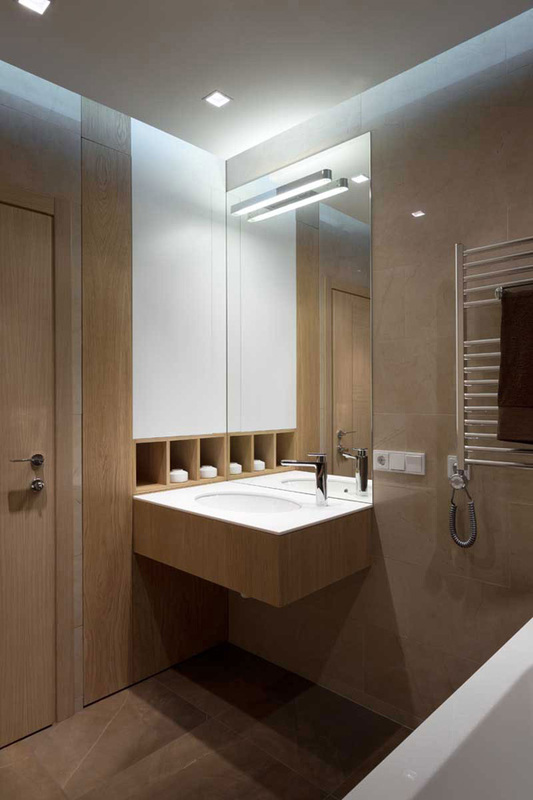 Simple yet functional lights and fixtures are used effectively in this hygienic and simple bathroom. Patterns and creative style of this bathroom draws the best concept and style here. 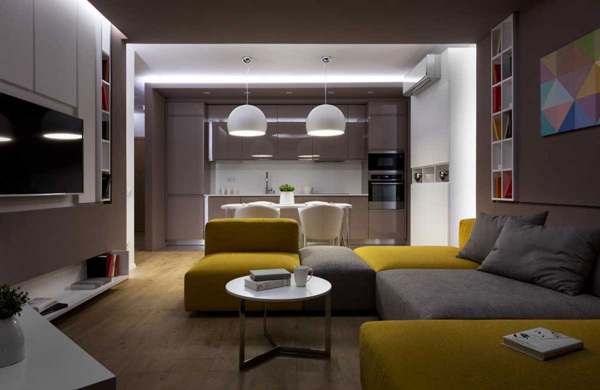 As we have enjoyed the different enticing areas of this apartment in the above images, we can say that the Denis Rakaev effortlessly draw the challenging effect of the lights, shapes and texture of the furniture and accessories in every parts of the house. The different colors of the accessories simply draw the modern aged technology in the interiors. Even if the space is limited the designer was able to utilize and maximized the available space for all the needed areas in the house. We hope that you may not just see its design but the functions as well that will be best applied in your apartment, too.